Like all of our previous reports, this update is based on information we are continually compiling from many sources—not only clients but also leaders in the profession as well as knowledgeable observers. Some of our findings are obvious but we include them because they continue to affect the profession. Other of our findings may not have been recognized yet but, we believe, will have an impact sooner or later. Put together they paint a picture of a profession that not only continues to change but has already entered a state of confusion and uncertainty. Labor & Employment. The Labor Department’s efforts to enforce the Fair Labor Standards Act regarding minimum wage and overtime pay has caused contentious debates over the legal definition of an “employer” and an “employee” at companies like McDonald’s. There are also legislative battles in a growing number of states on raising—or not raising—the minimum wage. Meanwhile unions continue their organization activity. Health Care. After the Supreme Court decision on the Affordable Care Act, regardless of what it is. Elder Law. Has been “getting hot” for several years because—as you may have noticed!—people are living longer. Has even become a separate practice area from Family Law as more firms hire paralegals or social workers to assist estate planning clients in selecting assisted living and extended care facilities. Energy. In the U.S., oil and gas continue to be hot while various forms of “clean energy” continue to raise issues. However, oil has cooled off considerably in many of the foreign markets due to the continued drop in oil prices and the continued surplus in the U.S. Fracking is still hot in some parts of the U.S., cool in others. Public Finance. The growing number of infrastructure projects is part of the reason for the increase in municipal bond transactions. Mergers & Acquisitions. Due to the improving economy and availability of financing. Litigation. There has been some decline in the major litigation that was going to the largest firms. Some of the reasons: 1) Clients are making greater use of contract lawyers and outsourcers (many of whom are off-shore) and 2) More companies are developing pricing, project management and process improvement policies. Just as the night follows the day, layoffs—particularly of associates—show signs of resuming. So far there has been less of an impact—note we say “less”—on mid-size firms and litigation boutiques that have maintained lower fees or have developed alternate fee arrangements. But the key question is, “Is this trend towards less litigation permanent?” Some thoughtful litigators say “no” because litigation always increases in a poor economy and they believe the economy will be soft for the foreseeable future. Bankruptcy. A casualty of the economic recovery. Some firms have even spun off the practice area. But another recession would heat the area up pretty quickly. There are many examples of creative and well-implemented strategies which, in some cases, are also productive. As we listed in our 2014 year-end report, websites, Google and LinkedIn are the three major sources in-house counsel use in searching for attorneys. The Great Divide. Depending on which reports you read, revenues at the 15 largest and most profitable U.S. firms reportedly grew 6.6% in 2014 while revenues at the next tier of 170 firms increased only 4% although two of those firms reported 19% increases. However, the picture gets more confusing because some of these firms raised their standard rates more than 9% over the last three years and hourly rates for the super-star deal, tax and trial lawyers at these firms soared well past $1,100. But, because of discounts and write-offs, according to Thomson Reuters Peer Monitor, collection realization for these firms has dropped since 2007 from 92% to 85%. In other words, even with some substantial increases in revenues, the gap between the “sticker prices” and the resulting “cash in the door” actually widened for some firms. The big get bigger. Meanwhile, at least five firms are committed to a “go big and go global” strategy—Denton’s (6,600 lawyers), Baker & McKenzie (4,600 lawyers), DLA Piper (4,500 lawyers), Norton Rose Fulbright (3,800 lawyers), King & Wood Mallesons (2,700 lawyers). Realization rates. As noted above, they continue to fall—and not just at the larger firms. SOME SOURCES SAY THE OVERALL AVERAGE IS NOW AS LOW AS 83%. Law school applications continue to decline. According to the Law School Admission Council, as of mid-April there was a total of 47,172, down 4.7% from that point last year and from over 80,000 at the same point five years ago. In the peak year of 2004, there were over 90,000 applications. Law school enrollment. Has been declining since 2011. It was down 4.4% last year. 2014 law school graduates. As of March 15 this year, 60% were employed, up from 57% for the class of 2013. However, this is probably the result of fewer entry level lawyers looking for work than for any actual improvement in the job market. Total legal employment—lawyers, paralegals, legal consultants, process servers, notaries and patent agents—was approximately 1,120,000 in 2014, According to several sources this was “tens of thousands” less than it consistently was from 2003 to 2007. Parental Leave. In May, Orrick, Herrington and Sutcliffe announced it was increasing its parental leave program for primary caregivers to 22 weeks. Writing in Fortune, chairman and CEO Mitch Zuklie stated it will be “the leading policy in the large law firm market.” The firm is also reviewing its policies in its 16 foreign offices. Partner departures. While many firms are initiating areduction in their equity partner ranks, others are discouragingdepartures they did not initiate by increasing enforcement ofcontract provisions for notice and repayment of capital. Cybersecurity. Firms continue to either substantiallyincrease their internal processes and systems or turn toexperienced providers. Partner evaluations. 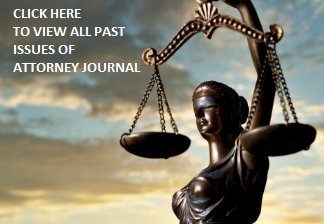 A number of firms use evaluations toclassify certain partners as “unproductive” and either removethem from equity partnership or get them to leave the firm.However, as discussed in my article in the March issueof the excellent newsletter Of Counsel, certain firms arerealizing that properly conducted evaluations can improvetheir overall performance as well as their profits. Practice organization. St.Louis-based Husch Blackwellhas become the first known firm to abandon the traditionalpractice group structure by area of law and organize the entirepractice into industry groups—natural resources, finance,agri-business, health care, real estate and manufacturing & technology. This is an obvious approach that we have been advocating for years. Look for other firms to follow. Outside directors. I serve as an outside director for severalcompanies. Several years ago I wrote a Legal Communiquerecommending law firms elect non-partner, non-lawyersto their executive committees. In May, Patrick McKenna,one of the most knowledgeable and respected consultantsto the legal profession, wrote an article for Legal ExecutiveInstitute stating that firms need to employ one or morenon-executive directors on their boards or executivecommittees. The Big Four. The combined revenues of Deloitte, EY,KPMG and PwC exceed those generated by the 100 largestlaw firms combined. But most significant is that Britainand Australia have authorized multidisciplinary practices(MDPs) which let lawyers share profits with members of otherprofessions. Since then the Big Four have been acquiringsmall law firms, recruiting lawyers as lateral entry partnersand recruiting at law schools in these two countries whilemerging in law firms in China, Germany, Canada and Spain.As a result, their combined legal revenues have grown atdouble-digit rates. Of course they are currently prohibitedfrom practicing law in the U.S.—but this trend will eventuallydevelop into competition for U.S. law firms. Bob Denney is President of Robert Denney Associates, Inc. He and the firm provide management, marketing and strategic planning counsel to law firms and privately held companies throughout the United States and parts of Canada. He has authored or co-authored seven books and has written many articles on these subjects. For information about Bob, the firm and their services, visit their website www.robertdenney.com. About the Author: Bob Denney is President of Robert Denney Associates, Inc. He and the firm provide management, marketing and strategic planning counsel to law firms and privately held companies throughout the United States and parts of Canada. He has authored or co-authored seven books and has written many articles on these subjects. For information about Bob, the firm and their services, visit their website www.robertdenney.com.